Description: Zooxanthellae are a very special type of marine plant . They are single celled algae which live inside the translucent fleshy tissue of many marine animals including types of giant clams, nudibranchs and even jellyfish, however they play their most important role when living within coral polyps. Like all other plants zooxanthellae need sunlight in order to photosynthesise and grow. Habitat: The host animals do not have any zooxanthellae in their larval forms and therefore must acquire them from the water column. The juvenile host filters the zooxanthellae from the seawater along with its food and once in the stomach of the host the zooxanthellae is passed into the surface flesh. Zooxanthellae multiply within the host by simple cell division. Ecology: Zooxanthellae can provide up to 90% of a coral’s energy requirements. In return, the coral provides the zooxanthellae with protection, shelter, nutrients (mostly waste material containing nitrogen and phosphorus) and a constant supply of carbon dioxide required for photosynthesis. 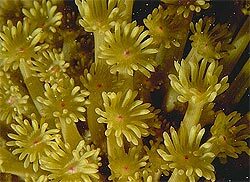 Their population in the host tissue is limited by available nutrients and light, and by expulsion of excess cells so their growth is limited to the lightest ocean zone,the photic zone. The symbiotic relationship is probably responsible for the success of corals as reef-building organisms in tropical waters. Interesting facts: When corals are subjected to high environmental stress, they can lose their zooxanthellae by either expulsion or digestion and die. The process known as coral bleaching occurs when the zooxanthellae densities within the coral tissue become low or the concentration of photosynthetic pigments within each zooxanthella decline. Color loss is also attributed to the loss or lowering of concentrations of Green Fluorescent Proteins (GFP) from the cellular pigments of the cnidarian itself. The result is a ghostly white calcareous skeleton, absent of zooxanthellae, with the inevitable death of the coral unless conditions improve, allowing for the zooxanthellae to return. Corals are under constant disturbance, which is ultimately felt by the zooxanthellae living within their tissue. Exposure to air during extremely low tides or damage from intensifying solar radiation in shallow water environments are some of the ecological stressors zooxanthellae face. Temperature changes have provided the most stress to the zooxanthellae-coral relationship. A rise in temperature of 1-2 degrees Celsius for 5-10 weeks or a decline in temperature of 3-5 degrees Celsius for 5-10 days has resulted in a coral bleaching event.